Manufacturer & Exporters of Alloy Steel ASTM A691 Gr.2 1/4 CR Seamless Pipe & Gr.2 1/4 CR Welded Pipe, Alloy Gr.2 1/4 CR ERW Pipes, Alloy ASME SA691 EFW Pipe Supplier in India. The ASTM A691 Gr. 2 1/4 CR pipes are classified according to steel grades and are designated in classes according to the type of heat treatment performed in the pipe manufacture, whether the weld is radio graphically examined, and whether the pipe has been pressure tested. The steel welds shall be made either manually or automatically by an electric process involving the deposition of filler metal. We are one of the well-known manufacturer & exporter of ASTM A691 GRADE 2 1/4 CR Alloy Steel Pipes that are made as per standard quality of raw materials. Used in high pressure fuel injection tubing and hydraulic tubing, these are reckoned for superior quality and durability. At our in-house manufacturing facility, these ASTM A691 Gr. 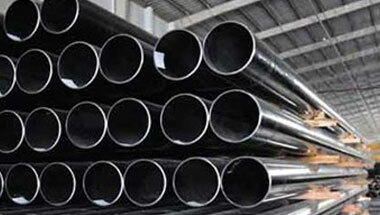 2 1/4 CR pipes are manufactured with world-class raw material. Meanwhile, we offer these Alloy Steel Pipes in different sizes, grades and thickness as per custom-made demands provided by our customers at a very reasonable price. These ASTM A691 Gr. 2 1/4 CR available in Single Random, Double Random & Required Length with Plain End, Beveled End, Treaded end. Alloy ASTM A691 Gr.2 1/4 CR High Pressure Pipe Exporter, Alloy Steel Gr.2 1/4 CR Fabricated Pipe, ASME SA691 Gr.2 1/4 CR SAW Pipe, Alloy Steel Gr.2 1/4 CR LSAW Pipe Manufacturer in India. Azerbaijan, Algeria, Kuwait, Sudan, Kazakhstan, Morocco, Angola, Dubai, Australia, Saudi Arabia, Iraq, Jordan, Italy, Argentina, Mozambique, Germany, Tunisia, Colombia, Uganda, Brazil, Democratic Republic of the Congo, Venezuela, UK, London, Houston, Indonesia, South Africa, Peru, Egypt, Russia, Chine, Israel, Cameroon, Ghana, Vietnam, Iran, Mexico, New Zealand, Bahrain, UAE, Malaysia, Ethiopa, Canada, Thailand (Bangkok), Nigeria, Sri Lanka, Turkey, Africa, Trinidad and Tobago, United States. Dar es Salaam, Giza, Fez, Subra al-Haymah, Port Elizabeth, Harare, Manama, Soweto, Accra, Lusaka, Addis Ababa, Casablanca, Douala, Yaoundé, Omdurman, Aqaba, Cape Town, Kinshasa, Durban, Dubai, Dakar, Bethlehem, Luanda, Tehran, New York, Johannesburg, Muscat, Ibadan, Pretoria, Lubumbashi, Lagos, Abu Dhabi, Istanbul, Antananarivo, Byblos, Kano, Brazzaville, Cairo, Maiduguri, Mecca, Kaduna, Conakry, Tel Aviv, Alexandria, Port Harcourt, Doha, Nairobi, Bamako, Rabat, Amman, Zaria, Maputo, Riyadh, Jerusalem, Singapore, Kampala, Ouagadougou, Kolwezi, Tripoli, Mbuji-Mayi, Abidjan, Hong Kong, Algiers, Jeddah, Mogadishu, Colombo, Cairo, Data from the UN, Khartoum, Bulawayo, Freetown, Benin, Beirut, Dammam, Sharm el-Sheikh.